Welcome to Shadow Ridge a smoke free, motorcycle, WIFI and pet friendly (no cats) amazing and upscale 4 bedroom 3.5 bath log cabin just for you. This delightful home over 3,600 square feet is situated at about 3,000 foot elevation and over an acre nestled in a private setting with mountain views. 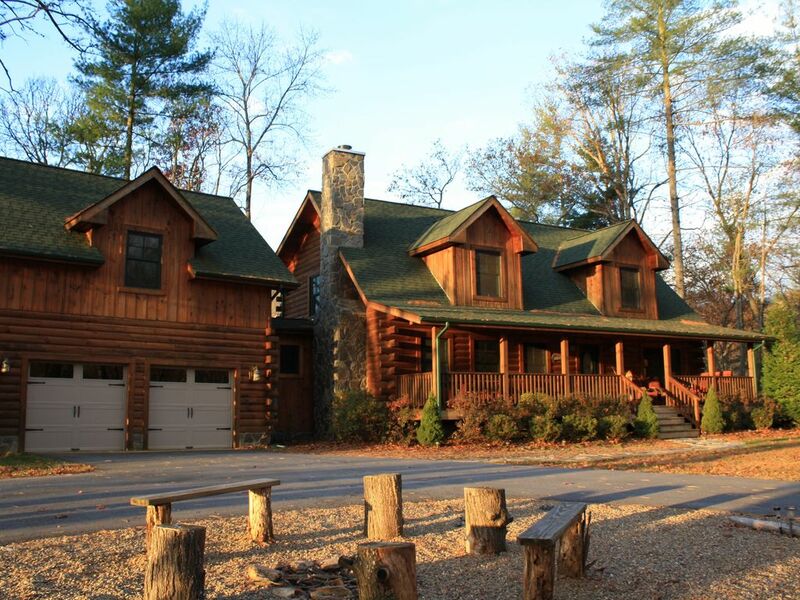 It's only short drive to Maggie Valley or Waynesville and many great surrounding attractions. You will love the care that went into making this mountain home a special place for your family and friends. Mountain decor, a fun game room (even a Wii), hot tub, luxurious baths, one wood burning and one gas fireplace, wireless internet access, two car garage and so much more this will be a cabin where you will want to return again and again. This home is furnished with master on main level with one king bed, upstairs there are two bedrooms one with a queen bed and the other with two twins along with a loft that has a full size sleeper sofa. Downstairs there is a queen size sleeper sofa in the living area and a separate bedroom with a queen size bed. 3 and a half baths with the master on the main floor, a full bath upstairs shared by both bedrooms, a full bath in the gameroom and a half bath on the main floor. I chose this cabin due to the location. My family used to vacation here when I was a child. It is the perfect place for everyone regardless of age to enjoy the beautiful mountains and create lasting memories. The cabin is so warm and cozy with warm wood throughout and minimal sheetrock. The wood burning fireplace is nice to share family moments in front of. The gameroom, with the gas fireplace, shuffleboard table and foosball table, make for fun evenings at home. The cabin was clean and neat when we arrived. The cabin was decorated sweetly for fall. Everything was needed in order to celebrate Thanksgiving with our family. Only minor issue of very slow and spotty WIFI. However, we all had great cell service to make up for it. I would stay here again anytime. House was high on a hill and nice yard. The inside was decorated for the fall season everywhere! Large spacious and comfortable. We loved it!! It was a cute, homey cabin with all of the beds and entertainment we needed and mountainy decor. Living/eating area was a little small for 10-12 people but it still worked out. Thank you , Teri! Your home was just what we needed! Our group thoroughly enjoyed our stay. Space for everyone and very easy to find. Convenient to the highway to get in and out of Asheville and your recommendations for downtown Waynesville were a hit! Thank you again - our group loved everything from the themed rooms to the games to the fully stocked kitchen. Home away from home, for sure! This was a wonderful place to get together with family. Very comfortable and clean. Beautiful view and tastefully decorated. The little people that visited the downstairs space loved “all the nature INSIDE the house”. Close enough to town and very close to all the wilderness you could want. Loved it. It was so peaceful. My family came from Ohio and Texas. The neighbors German shepherd runs loose so you need to watch for that. The garbage policy needs changes. We had awesome time love the decor. Awesome 3 day weekend.